Click on the hashtag #Scio14 to view all of my posts from ScienceOnline Together. Before boarding the shuttle to the conference center this morning, I took a quick trip across the street from my hotel to check out this bronze statue. 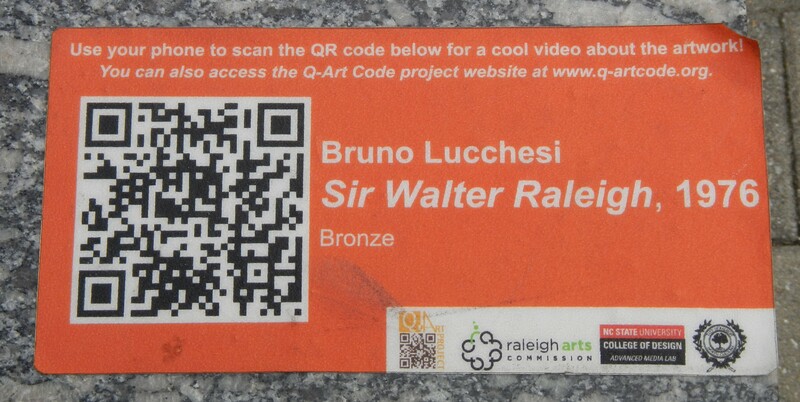 The statue is of Sir Walter Raleigh, and he is part of the Q-Art Code Project in downtown Raleigh. Once I scanned the bar code at the base of the statue, I was brought to a website that told me the history of the statue and the “clothing” Sir Walter Raleigh wears from time to time (seems here like his tutu has fallen down to his ankles). This also makes me realize that I never heard the phrase “QR Code” mentioned in any of the sessions, although I did scan one to enter the book raffle (see my Friday AM post). The keynote was presented by a research scientist (Jon Schull) from Rochester Institute’s Center for Media, Art, Graphics, Interactivity and Creativity (MAGIC) and a high school student (Nick Parker). 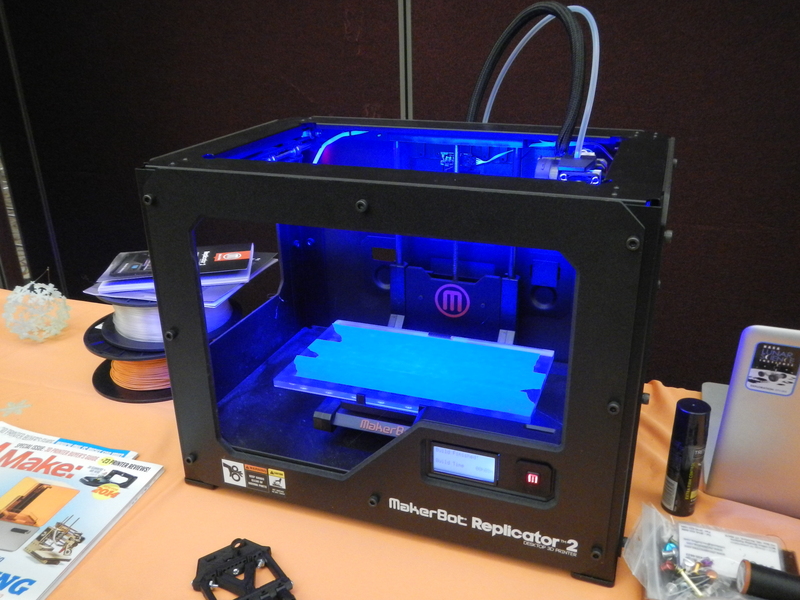 You need to watch this video from E-nabling The Future to learn the background of how an online collaboration between someone in South Africa and someone in Washington, each with their own 3D printer, can make the amazing happen. And if you have not been “wowed and amazed” yet, check out this little girl (link to Facebook Page post) who just got her pink hand days before Valentine’s Day – in time to make a heart with her fingers! And then, if the stories and photos weren’t enough, we were introduced to Tully. Tully is a 9 year old boy that is having a hand printed by Karyn Traphagen – the first glow-in-the-dark hand! When Jon talked about how all of this fell into to place, it sounded so simple. The MakerBot video from above is on YouTube, and he placed a comment under to encourage those that want hands and those that are willing to use their 3D printers to print the hands to plot their location on a Google Map. This then led to a Google+ page, the Facebook page, and the WordPress site. It was using online tools to connect those in need with local assistance. Joe also referred to this as the “new shop class” for school, and shared the broader impacts – new ways of learning, new ways of helping, being a global citizen, being human, connected with collaborators in the cloud, connected communities, collective intelligence and compassion, and distributed manufacturing and mass communications. We also had another important take-home message shared by Nick: “If you blog, share this story to grow this community.” You got it, Nick! After a break, I headed to a conference workshop I signed up for called Creating a Science [Board or Online] Game. The workshop leader started by defining “what is a game?” and giving us nine valuable tips for development (invent rules engine, pick a theme, pick a format, etc.). We then divided in to groups for each group to develop one game. Unfortunately, I found this discouraging, as I came to the workshop with a specific game I want to develop in mind, as did everyone else in the room, and the majority of us were not able to work on or ask for feedback on our own game designs. One of my group members shared an interesting video from a session he attended earlier in the conference, a clever game called Can You Solve This? I decided to leave this session to head over to another one that started at Noon, detailed in my next post!